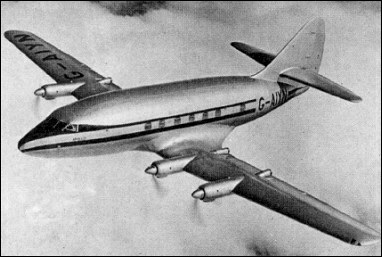 The Armstrong Whitworth AW.55 Apollo was designed as a competitor to the Vickers Viscount in response to the requirement outlined in the wartime Brabazon Committee's Type II civil transport. It was a short- and medium-range airliner intended for operations in Europe. Specification C.16/46 to which the Apollo was designed, called for a turboprop-powered airliner to carry between 24 and 30 passengers over a range of 1609km at 483km/h. The engine selected was the axial-flow Armstrong Siddeley Mamba centrifugal-flow turboprops but it was prone to teething problems. In the form first used on the Apollo, the engine should have developed 1010hp plus 139kg thrust, whereas it developed only 800hp. Right from the beginning of the design, the AW.55 (first named Achilles and Avon before finally becoming Apollo) had a span of 28.04m, but length was increased from 19.66m to 20.73m and at the production stage to 21.79m, providing accommodation for between 26 and 31 passengers seated two-abreast on each side of a central aisle. Construction began in 1948 of two flying prototypes and a fuselage for static testing. The first prototype was given the Ministry of Supply serial VX220, and made its initial flight on April 10, 1949. Control problems were remedied and the first prototype, re-registered G-AIYN, was available from October 30, 1950 for proving flights, starting with a successful flight to Paris on March 12, 1951. In July 1951 the Mamba Mk 504 engines became available, but even these had severe limitations and problems and in June 1952 further development was halted. The second prototype was completed, and both aircraft were used for a variety of experimental work for the Ministry of Supply, which had funded them. Both aircraft became structural-test airframes in December 1954.